New Mexico Supreme Court decides that "aid in dying" is assisted suicide and there is no right to assisted suicide. 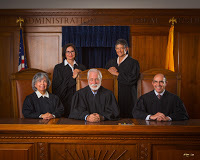 The New Mexico Supreme Court decided in a 5 - 0 decision upheld the New Mexico Court of Appeal decision that assisting a suicide is a crime in New Mexico in Morris v Brandenburg. The Supreme Court decision was based on an activist lower court decision that found a right to assisted suicide in New Mexico. Catherine G. Foster, an attorney with the Alliance Defending Freedom who represented legislators urging the court to uphold the Court of Appeals and find no right to aid in dying, told Scott Sandlin from the Albuquerque Journal that the Supreme Court decision is “a win for all New Mexicans. 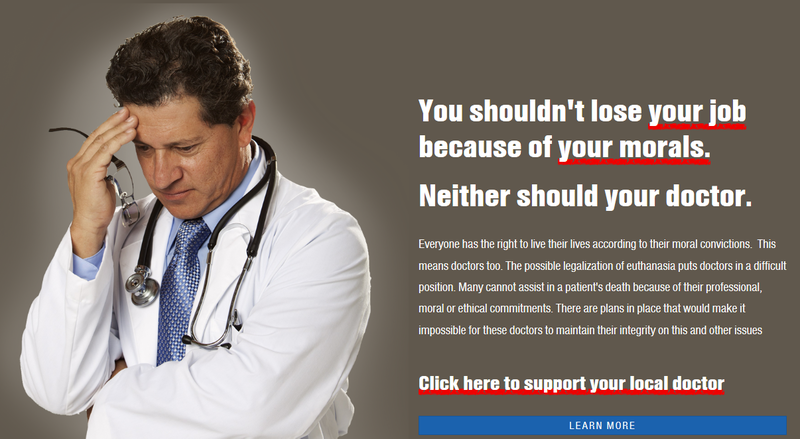 the State has legitimate interests in (1) protecting the integrity and ethics of the medical profession; (2) protecting vulnerable groups—including the poor, the elderly, and disabled persons—from the risk of subtle coercion and undue influence in end-of-life situations, including pressures associated with the substantial financial burden of end-of-life health care costs; and (3) protecting against voluntary or involuntary euthanasia because if physician aid in dying is a constitutional right, it must be made available to everyone, even when a duly appointed surrogate makes the decision, and even when the patient is unable to self-administer the life-ending medication. Therefore, we decline to hold that there is an absolute and fundamental constitutional right to a physician’s aid in dying and conclude that Section 30-2-4 is not unconstitutional on its face or as applied to Petitioners in this case. The original case was based on a word game. 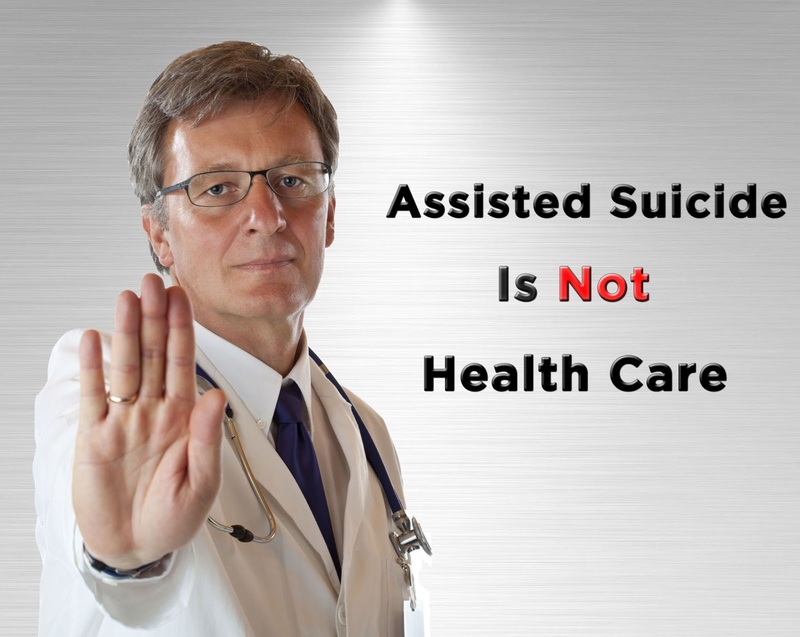 The original case argued that "aid in dying", which is also known as assisted suicide, is not prohibited by the New Mexico assisted suicide law because "aid in dying" is not assisted suicide. 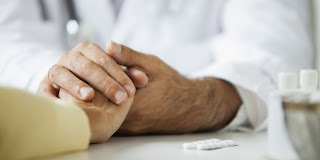 For aid in dying, the lethal dose prescribed by a physician is intended to provide the means for a patient to end his or her own life, which is consistent with how “aiding” has been defined under Section 30-2-4. Therefore, when providing aid in dying, a doctor prescribes a lethal dose of barbiturates for the patient’s use as a means to end his or her own life—conduct clearly encompassed by the plain language of Section 30-2-4. 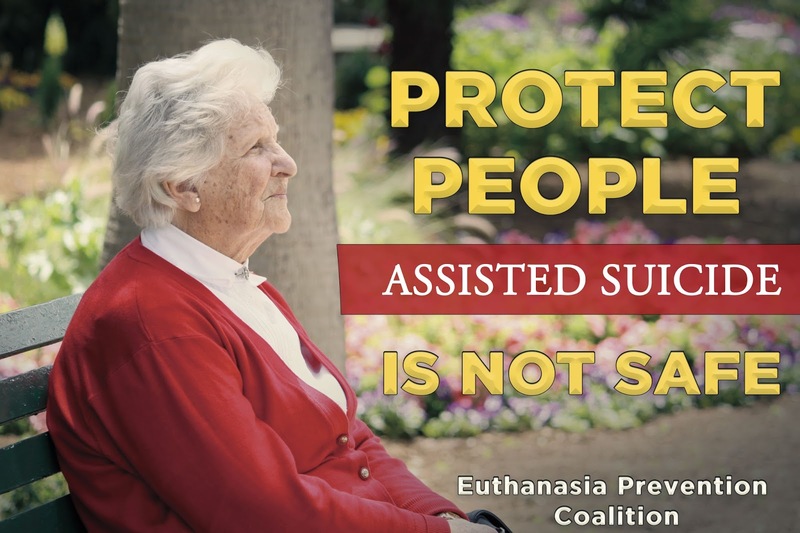 The original case also argued, that if "aid in dying" is assisted suicide, then the New Mexico assisted suicide law is unconstitutional because it undermines the right to privacy and autonomy. We may diverge from the Glucksberg precedent if we determine that the federal analysis is flawed or that New Mexico has distinct characteristics in the relevant area or that structural differences between our government and the federal government exist. Gomez, 1997-NMSC-006, ¶ 19. For the reasons that follow, we choose not to deviate from either the ultimate holding in Glucksberg or the suggestion that a more particularized showing might prevail. we conclude that there are no distinctive state characteristics with respect to the due process protections of Article II, Section 18 that warrant a departure from the federal analysis holding that physician aid in dying is not a fundamental right. We are persuaded that end-of-life decisions are inherently fraught with the potential for abuse and undue influence as evidenced by the protections outlined in the UHCDA and the Pain Relief Act, and therefore the government interests we have identified, similar to those in Glucksberg, are supported by a firm legal rationale. 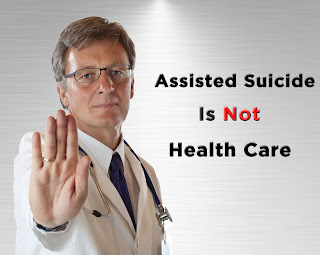 Therefore the New Mexico Supreme Court in a unanimous decision upheld the state assisted suicide law, they determined that aid in dying is assisted suicide and therefore applies to the state assisted suicide law and that the New Mexico assisted suicide law is not unconstitutional. 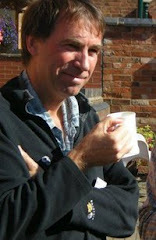 Links to previous articles on the New Mexico Morris v Brandenburg assisted suicide case. New Mexico Supreme Court to hear assisted suicide case. New Mexico Court of Appeal overturned activist lower court assisted suicide decision. New Mexico court of appeal heard assisted suicide case. 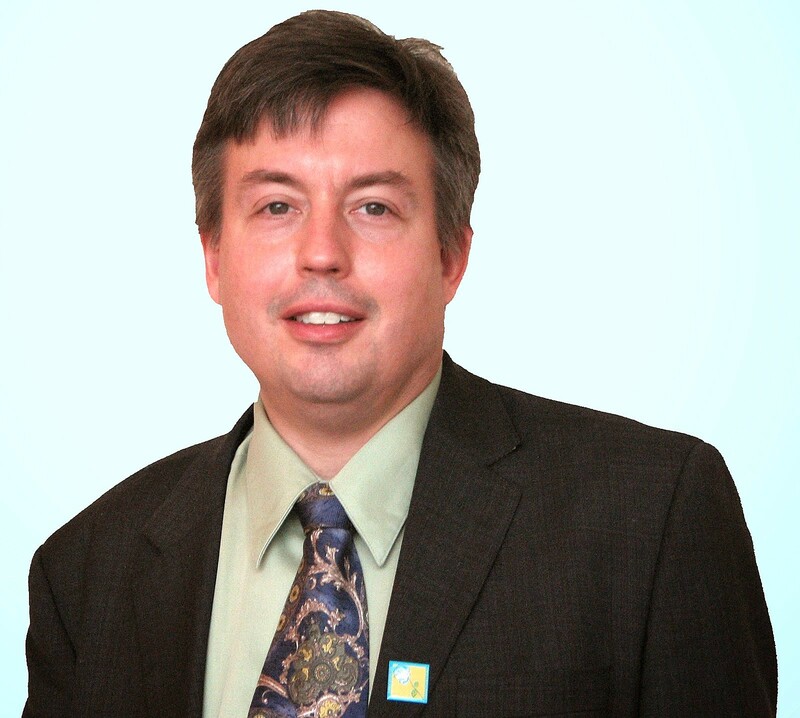 New Mexico Attorney General appeals assisted suicide court decision. Attorney General must appeal assisted suicide court decision in New Mexico. Belgium nursing home ordered to compensate family for refusing to participate in euthanasia. A civil court in Leuven Belgium ordered a Belgian nursing home to compensate a family because the nursing home refused to participate in euthanasia. According to the European Institute of Bioethics report, the civil court ordered the Sint Augustinus nursing home to pay 6000 euros to the family of Mariette Buntjens, "for the harm they suffered from having to move their mother so that she could be euthanized". Mariette Buntjens (74) died by euthanasia in the family home in August 2011. The family claimed that the the nursing home refused to allow doctors to interview their mother at the nursing home for the purpose of euthanasia. 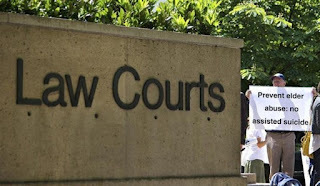 During the trial (May 18, 2016) the nursing home told the court that the conditions for euthanasia were not met and the nursing home claimed that the doctors had not contacted the nursing home medical team for the interview. 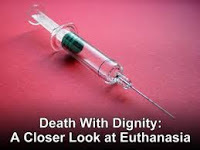 Courts should consider the pressure that is exerted on elderly people to die by euthanasia. The Euthanasia Prevention Coalition hopes that the nursing home will appeal the decision. Link to a previous article on this case. The Québec government is now insisting that hospitals euthanize people promptly. The Québec government's insistence that hospitals euthanize people in Palliative care units contradicts the medical code of conduct of physicians, who have an obligation to provide the best medical care for their patients. 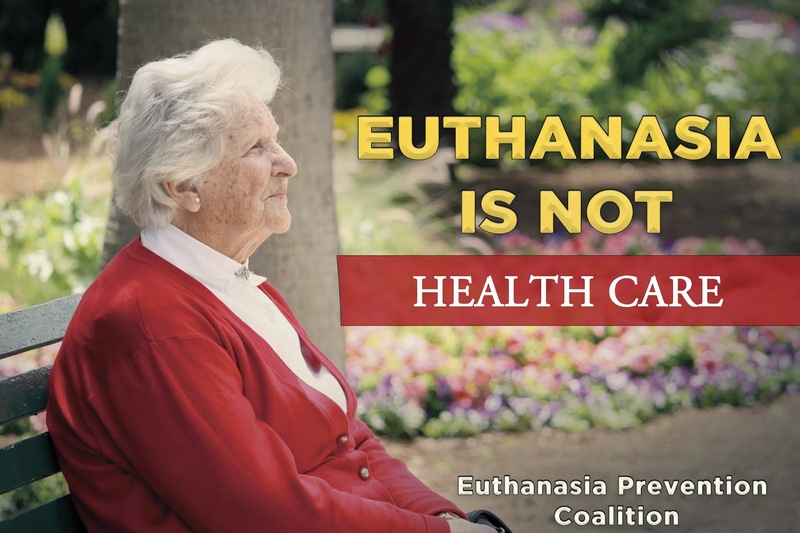 Euthanasia does not meet the standards of best medical care for people who are at the end of life and require palliative care. Despite the Québec law and more recently the Canadian Law, no physician has an obligation to perform euthanasia or assisted suicide. The Québec law requires that the treating physician who receives a request for euthanasia and objects to administering it for personal reasons must refer the request to the medical director of the establishment. Nevertheless the Québec law and Federal law are being challenged in the Québec Superior Court. 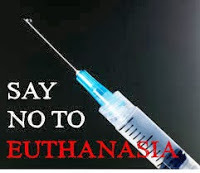 It is noteworthy that the World Medical Association advises physicians to actively refuse to abide by euthanasia or assisted suicide laws even in jurisdictions where laws have been passed. 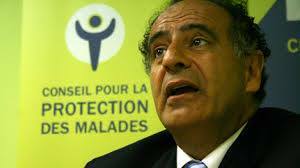 Dr Paul Saba, who is contesting both the Quebec and Canadian euthanasia laws, states that euthanasia and assisted suicide are dangerous and will cause the needless loss of lives of people who may have many years to live. Palliative care is a place where only palliation must be practiced. Patients have a right to be protected and not pressured into ending their lives prematurely. The Québec government is acting recklessly and dangerously in transforming Palliative Care units into euthanasia units. Even the Québec law recognizes a distinction between Palliative care and euthanasia. People who want to live their lives to the end in dignity surrounded by loved ones deserve the respect and support offered by Palliative care units. They have the right not to live in fear of being killed prematurely by a lethal injection. Physicians also have the right to care for their patients according to the highest standards of medical care which includes palliative care but does not include euthanasia. "This reveals that Quebecers and Canadians want good health care and not euthanasia as the solution for the lack of access to medical care"- states Dr. Paul Saba, a family physician. "Many Canadians wait a long time for: physicians, specialists, screening, testing and treatments. Canadians' access to specialist and primary care is the lowest among 11 comparable countries." Attorneys Dominique Talarico and Natalia Manole, who represent Dr. Saba in his legal challenge against euthanasia, state that "In the absence of appropriate medical care and services, it is impossible to give a free and informed consent to receive physician-assisted suicide. By not having access to the good care, a person may end his or her life prematurely." 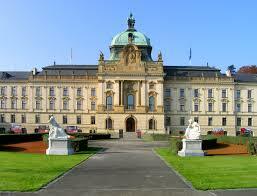 Euthanasia and assisted suicide in the Netherlands Belgium and Oregon - a comparative analysis. Since the introduction of the Dutch euthanasia law in 2002, the number of notifications for euthanasia nearly tripled. In 2015 doctors in the Netherlands reported 5516 cases of euthanasia or assisted suicide. (1) One of these reports came from the BES islands. In 109 patients dementia formed the basis of the suffering and in 56 patients a psychiatric disorder. Although the reporting rate for euthanasia over the years greatly increased, there is still underreporting. In 1990, doctors reported only 18% of the number of cases, in 2001, 54% and in 2010. 77%. (2) This means that still 914 cases of euthanasia were not reported in 2010. Doktor didn't examine the New England Journal of Medicine (NEJM) published a study on March 19, 2015 showing that 4.6% of all deaths in Flanders (2013) are euthanasia, even though the official data indicates that 2.4% of the deaths are reported as euthanasia indicating that nearly half of all Belgian euthanasia deaths are not reported. According to the 2015 Oregon death with dignity data summary, of 218 people who received a lethal prescription, the ingestion status was unknown for 43 of the people and 5 of the people who died, no report was submitted, meaning these are possible cases of underreporting. 1. Regional assesment committee on euthanasia. 2015, April 2016. Jaarverslag (Yearly report). 2. In vestigation of death cases in the Netherlands. Sterfgevallenonderzoek 2010. Euthanasie en andere medische beslissingen rond het levenseinde. 10 juli 2012. 3. Yearly reports Death with Dignity Act Oregon, via Public Health Oregon. 4. Death statistics Oregon, via Public Health Oregon. 5. Year reports euthanasia Belgium 2002-2015 http://leif.be/professionele-info/rapporten/. 6. Death statistics Belgium 2000-2015, Statbel mortalité generale. 7. Regional assessment committee euthanasia, Jaarverslag 2002-2015 (Yearly reports). 8. Death statistics the Netherlands 2000-2015, Statline CBS. 9. Claudia Gamondi et al. Legalisation of assisted suicide: a safeguard to euthanasia? The Lancet, vol 384, 12 juli 2014. 10. Cohen et al. Cultural differences affecting euthanasia practice in Belgium: one law but different attitudes and practices in Flanders and Wallonia. Soc Science & Medicine. 2012, 17 mei (Epub ahead of print). The first court case to expand euthanasia in Canada. The Liberal government faced mounting criticism that the law, known as Bill C-14, was too restrictive, due to a provision that says a patient’s natural death must be “reasonably foreseeable” in order to qualify for assisted death. The Senate voted to remove that requirement, but the Liberal government rejected the amendment and the Red Chamber passed the bill with several small changes. EPC argued that the "terminal illness" (natural death must be reasonably foreseeable) definition in the bill lacked definition and meaning. This is the first of many court challenges to Canada's euthanasia and assisted suicide law. The euthanasia lobby are wanting to extend euthanasia to "mature" minors, to people with dementia (through advanced directives) and for people with psychiatric conditions alone. EPC will examine this legal case and then determine how we will respond. 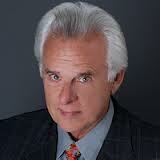 Wesley J. Smith - Culture of Death: The Age of "Do Harm" Medicine. In 2001, Wesley Smith published one of the most influential books challenging the culture of death. At that time, EPC sold hundreds of copies of the book. Since then, many people have been waiting for Smith to update his book and now we have it. Recently released, Wesley Smith has written an excellent defense of traditional ethics in his recent - Culture of Death: The Age of "Do Harm" Medicine. The Euthanasia Prevention Coalition (EPC) is selling Culture of Death for $35 (Link) (includes shipping). Indicate that the $35 is for Culture of Death which has 333 pages and is published by Encounter books. Smith: There is less respect for human equality and the sanctity of life in healthcare generally, I fear, and not only in the U.S. Indeed, I changed the subtitle of the book to “The Age of ‘Do Harm’ Medicine” because it now grapples with developments outside the United States as well as in my own country. We are all connected, so that what happens in Canada impacts Australia, what happens in the USA can have a pull on South Africa. 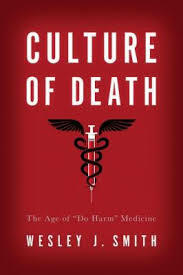 The Euthanasia Prevention Coalition is selling - Culture of Death - for a $25 donation (link) Culture of Death is published by Encounter books and has 333 pages. Czech Republic government cabinet rejects euthanasia. the cabinet said it goes counter to the coalition agreement in which the government parties, the Social Democrats (CSSD), ANO and the Christian Democrats (KDU-CSL), pledged not to pass anything that would be incompatible with the protection of life from the conception until its natural end. The bill on dignified death has been submitted by six deputies. The final decision will be up to parliament. Agriculture Minister Marian Jurecka (KDU-CSL) wrote that he rejects a simple solution of euthanasia. 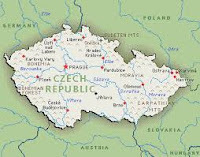 "I support help, loving care, solidarity and a high-level palliative care, this is a solution,"
The government... believes that it is unsuitable for the Czech Republic to follow the example of the countries where euthanasia is legal, which the authors of the bill suggest. "In these countries, cases of clear misuse of euthanasia have been proved, aimed to vacate hospital beds, as well as cases of family members pushing for euthanasia for dubious reasons, and also unpunished cases of the failure to observe the conditions set by law,"
A similar bill on euthanasia, submitted by a senator, was turned down by the Czech upper house in 2008. In April 2015, a Czech nurse confessed to killing 6 patients to decrease her workload. The Coalition for HealthCare and Conscience is seeking a judicial review of the College of Physicians and Surgeons of Ontario (CPSO) policy requiring physicians who oppose euthanasia and assisted suicide, to refer patients to a physician who will kill. British Medical Association (BMA) members reject neutrality on assisted suicide. The following is the report published by the Care Not Killing Alliance on June 21, 2016. Motion 79 (EAST MIDLANDS REGIONAL COUNCIL) That this meeting, with respect to Physician Assisted Dying, notes the recent rejection by Parliaments of efforts to overturn the law on Physician-Assisted Dying and therefore feels that it is not appropriate at this time to debate whether or not to change existing BMA policy. Motion 80 (SOUTH CENTRAL REGIONAL COUNCIL) That this meeting believes that the BMA should adopt a neutral stance on assisted dying. Several speakers noted that BMA policy exists to represent the views and experience of members, so it was perhaps not entirely surprising that Motion 79, which reflected on MPs' conclusions, was lost - if only by three votes (164-161). 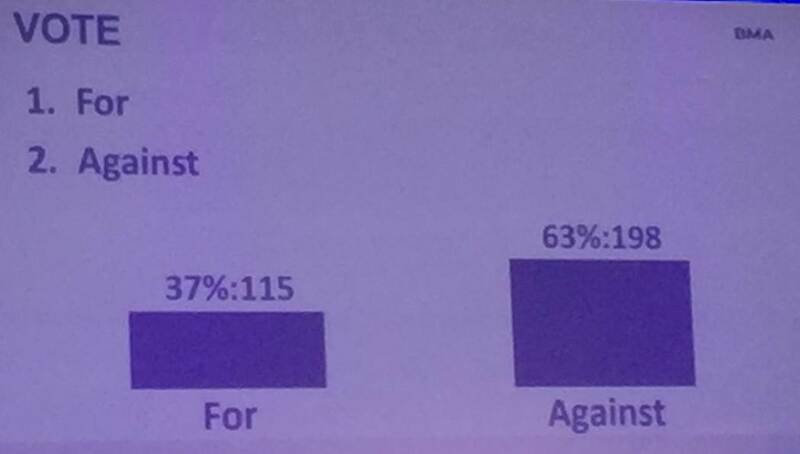 Motion 80, however, was rejected after strong speeches by a resounding 198-115 - that's 63% to 37%, or more simply, 2-1. Members wishing to speak on Motion 80 were similarly split, with those opposed to neutrality outnumbering those in favour by 2-1. Thus, the BMA remains opposed to assisted suicide, as it has throughout its history (barring a brief period in 2005-6). @TheBMA Please protect lives and resist neutrality on assisted dying. We look to you for #supportnotsuicide. Thank you. PLS patient. Many doctors spoke to the substance of the case against assisted suicide, especially foreign precedents. Professor the Baroness Finlay and Dr Will Sapwell highlighted, respectively, doctor-shopping and the increasing citation of not wishing to be a burden as a reason for assisted suicide in the US state of Oregon. Dr Sapwell also pointed to extensions of Belgium's euthanasia law, and medical student Heather Davis said that the Netherlands, with a healthcare system much like the UK's, had seen euthanasia numbers rise and eligibility extended as far as a young woman who suffered from PTSD as a result of sexual abuse. Closer to home, Baroness Finlay said that UK doctors were still strongly opposed to actually assisting suicides. All of this led to a key point, made several times. Ms Davis said that the BMA worked on the basis of evidence, and there was no new evidence to justify a changed stance. Dr Wannan said there was no new evidence - no, repeated opinion polling didn't count. And Professor the Baroness Hollins said that there was no new evidence, and that they must turn their attention to better end of life care. Yorkshire GP Dr Mark Pickering said that doctors must listen to their patients, but must also consider unintended consequences. This article was published on Peter Saunders blog on June 21, 2016. Today the Annual Representative Meeting (ARM) of the British Medical Association (BMA) in Belfast voted against going neutral on assisted suicide by a two to one majority (see detail here). Delegates rejected motion 80, ‘that this meeting believes that the BMA should adopt a neutral stance on assisted dying’, by 198 to 115 (63% to 37%). 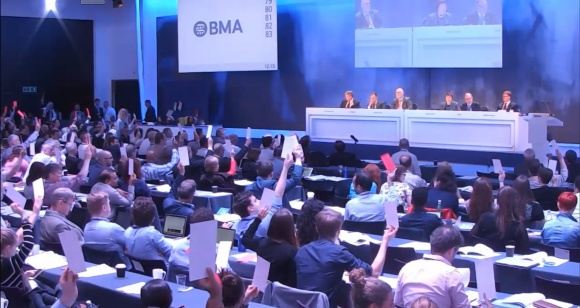 The debate took place after a previous motion affirming that ‘it is not appropriate at this time to debate whether or not to change existing BMA policy’ was defeated by 164 to 160. The BMA, the UK doctors’ trade union, has been opposed to the legalisation of assisted suicide and euthanasia for every year of its history with the exception of 2005-6 when it was neutral for just twelve months. 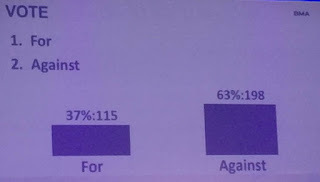 Fifteen doctors spoke during an impassioned debate on the two motions but the final vote was decisive, and reflected the 65% opposition to legalising assisted suicide shown in most opinion polls. The Royal College of Physicians, Royal College of General Practitioners and British Geriatrics Society are all officially opposed to a change in the law along with 82% of Association for Palliative Medicine members. Amongst all doctors, this latter group carries the greatest weight in this debate due to their understanding of the vulnerability of dying patients and their knowledge of treatments to alleviate their symptoms. Neutrality on this particular issue would have given assisted suicide a status that no other issue enjoys. Doctors, quite understandably, are strongly opinionated and also have a responsibility to lead. The BMA is a democratic body which takes clear positions on a whole variety of health and health-related issues. Furthermore, to drop medical opposition to the legalisation of assisted suicide and euthanasia at a time of economic austerity would have been highly dangerous. Many families and the NHS itself are under huge financial strain and the pressure vulnerable people might face to end their lives so as not to be a financial (or emotional) burden on others is potentially immense. In rejecting an attempt to move it neutral at its ARM in 2012 the BMA said that neutrality was the worst of all positions. This was based on bitter experience. When the BMA took a neutral position for a year in 2005/2006 we saw huge pressure to change the law by way of the Joffe Bill. Throughout that crucial debate, which had the potential of changing the shape of medicine in this country, the BMA was forced to remain silent and took no part in the debate. Were it to go neutral again it would be similarly gagged and doctors would have no collective voice. Going neutral would also have played into the hands of a longstanding campaign led by a small pressure group with a strong political agenda. Healthcare Professionals for Assisted Dying (HPAD), which is affiliated to the pressure group ‘Dignity in Dying’ (formerly the Voluntary Euthanasia Society), at last count had just over 500 supporters, representing fewer than 0.25% of Britain’s 240,000 doctors. Instead the BMA ARM wisely gave short shrift to this latest neutrality proposal and signalled by the margin of defeat that this matter should now be settled for the foreseeable future. 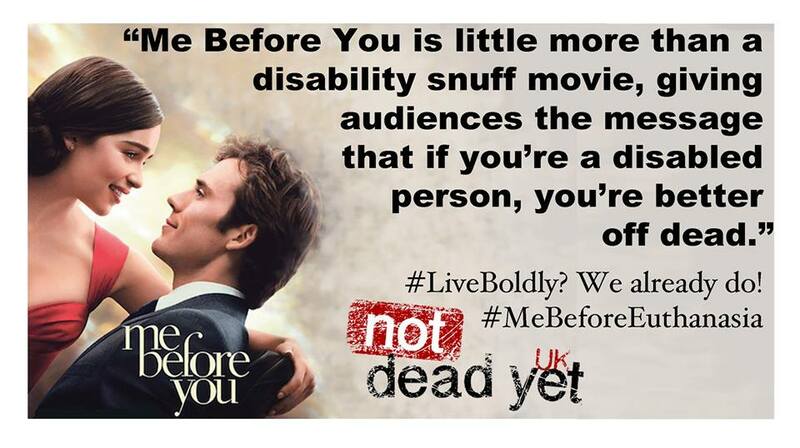 Disability author angry over association with Me Before You movie. 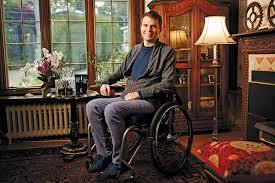 EW News reported that Francesco Clark, an ambassador for the Christopher and Dana Reeves Foundation and an entrepreneur who founded a skincare line for people with disabilities, is angry that his memoir, Walking Papers, is referenced in the film Me Before You. Walking Papers tells the story of Clark's life after he experienced an accident in his early 20's that resulting in him living with quadriplegia. The disability community has protested Me Before You throughout the world. There is no such thing as neutrality with assisted suicide. The assisted suicide lobby is once again pressuring medical association's to become neutral on assisted suicide. Last Monday, the American Medical Association (AMA) reacted to pressure from the Oregon Medical Association, to change the AMA stance on assisted suicide to neutral (Resolution 015) by establishing a Study on aid in dying. Tomorrow, the British Medical Association (BMA) will vote on two motions. The first motion (79 on the agenda): affirms that: ‘it is not appropriate at this time to debate whether or not to change existing BMA policy’. If the first motion is not passed they will debate a second motion (80) which states: ‘that this meeting believes that the BMA should adopt a neutral stance on assisted dying’. Physicians need to recognize that neutrality on euthanasia or assisted suicide does not exist. Either you support physicians lethally injecting patients (euthanasia) or writing prescriptions for lethal drugs (assisted suicide) or you don't. Further to that, if euthanasia or assisted suicide become legal, physicians are pressured to participate. In Belgium, physicians do not have to inject or refer their patients to a physician who will inject their patient, but physicians who are unwilling to refer patients are pressured to do so. A recent bill in the Belgian legislature would require physicians to refer for euthanasia. 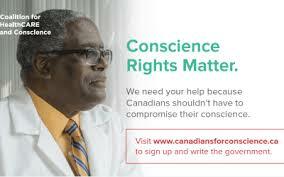 For instance, the Ontario College of Physicians and Surgeons have rejected conscience rights and decided that physicians don't have to lethally inject their patients, but they are required to "effectively refer" their patients to someone who will kill their patient. Neutrality is only a stepping stone to legalization. The assisted suicide lobby knows that the two most influential bodies of opposition to assisted suicide are the disability community and the medical community. If one or both of those communities become neutral, the odds of legalizing these acts substantially increase. Whether a physician opposes or supports assisted suicide, it is never an issue of neutrality, and if it becomes legal, there is always pressure to participate in acts that cause death. 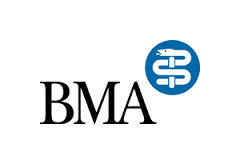 The BMA is the UK’s professional association and registered trade union for doctors and currently has170,000 members. "Canadians deserve quality medical care at all times of their lives. This includes having access to a family physician, early screening and detection of illnesses, and the latest treatments and cures. Many Canadians wait a long time for: physicians, specialists, screening, testing and treatments. Canadians' access to specialist and primary care is the lowest among 11 comparable countries. Canada's Parliament has chosen to focus on providing lethal injections rather than providing quality health care for its citizens. This is inexcusable and contrary to our laws and values. A recent Angus Reid poll shows that Canadians want good health care and not euthanasia as the solution for the lack of access to medical care." On June 1 before Parliament Hill, Dr. Saba called on Prime Minister Trudeau and Parliamentarians to promote better health care and save lives and to reject euthanasia and assisted suicide because "it is dangerous." Errors in medical diagnosis (up to 20% of cases). Errors in predicting who is at the end of life (up to 50% for chronic illnesses). Associated depression with a serious diagnosis and inability to make a free and informed decision to end one's life because of feelings of hopelessness. Inability to establish workable safeguards in countries where euthanasia is legal. For example: in Belgium, 32% of euthanasia deaths are performed without specific request or consent; and, 47% of cases go unreported. He called on the Canadian Parliament to set up a Royal Commission on Health Care and invest in nationally funded programmes for Cancer, Pediatric, Family, Pharma, Home, and Palliative Care. "Parliament has failed in its responsibility to protect the public by legislating for euthanasia and assisted suicide rather than for quality health care," states Dr. Saba. Attorneys Dominique Talarico and Natalia Manole, who represent Dr. Saba in his legal challenge against euthanasia, state, "In the absence of appropriate medical services, it is impossible to give a free and informed consent to receive physician-assisted suicide. By not having access to quality and rapidly accessible health care, a person may end his or her life prematurely."